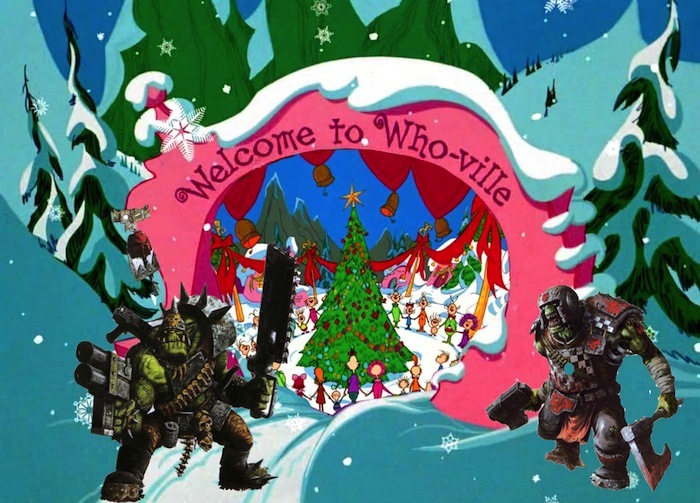 But Warlord Grinch, who lived just north of Who-ville, Did NOT! Da Grinch hated Christmas! The whole Christmas season! Now, please don’t ask why. No one quite knows the reason. It could be, perhaps, that his orky shoes were too tight. May have been that his orky heart was two sizes too small. Staring down from his cave with a sour, Grinchy frown at the warm lighted windows below in their town. For he knew every Who down in Who-ville beneath Was busy now, hanging a mistletoe wreath. “And they’re hanging their stockings!” he snarled with a sneer, “Tomorrow is Christmas! It’s practically here!” Then he growled, with his Grinch fingers nervously drumming, I MUST find some way to stop Christmas from coming! All the Who girls and boys would wake bright and early. They’d rush for their toys! And then! Oh, the noise! Oh, the Noise! Noise! Noise! Noise! That’s one thing he hated! The NOISE! NOISE! NOISE! NOISE! Then the Whos, young and old, would sit down to a feast. And they’d feast! And they’d feast! And they’d FEAST! FEAST! FEAST! FEAST! They would feast on Who-pudding, and Imperial roast beast. Which was something the Grinch couldn’t stand in the least! And THEN They’d do something He liked least of all! Every Who down in Who-ville, the tall and the small, Would stand close together, with Christmas bells ringing. They’d stand hand-in-hand. And the Whos would start singing! They’d sing! And they’d sing! And they’d SING! SING! SING! SING! Then he got an idea! An awful idea! THE GRINCH GOT A WONDERFUL, ORKY IDEA! “I know just what to do!” The Grinch laughed in his throat. And he called to his boyz to get ready to spread violence about. The Grinch looked around. But, since wagonz is scarce, there was none to be found. Did that stop the old Grinch…? So he called Doctor Morork. And they assembled some bitz. And when it was done, painted them red. ← The Greenskin Air Force arrives! The new substance, first identified by Prof. Ivor Goat of the University of New Terra, would revolutionize the Third Age. Dubbed Goatronium after its discoverer, it could provide nearly limitless energy to power cities, fuel spacecraft… or arm terrible weapons of war. As fate would have it, the richest deposits of Goatronium were to be found in The Fringes, an area of space where radiation disrupted warp navigation, and where only a few prospectors, hardy colonists, and desperate criminals had ever fared. Armies were marshaled. Fleets were readied. Generals were briefed: They must seize what Goatronium could be found in the Fringes—and at all costs prevent others from being the first to develop and test a Goatron Bomb. The Big Imperial Illustrated Book of Post-Quantum Theoretical Physics. The Greenskin Air Force arrives!